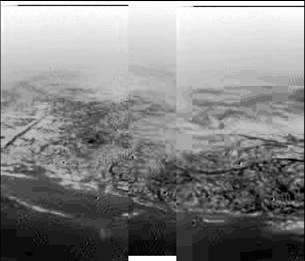 This composite image was taken about 5 miles above the surface of Titan yesterday, as Huygens was making its descent. That’s a picture of the surface of a moon of Saturn. A moon of Saturn! No one’s quite sure what the image shows. It appears to be some kind of shoreline, or highlands with drainage ditches running down into lower terrain. The ESA site has released some other images as well (including one in color), and even two sound clips, one from the descent and one from after the landing. It seems pretty quiet on Titan; cold and quiet. And brave little Huygens is down there all by itself - the first man-made object to have landed so far, far away. I have a tremendous amount of respect for all of the scientists and engineers who worked on this mission, but special thanks should go to the teams and team leaders who, throughout the day yesterday, were willing to juggle interviews, press conferences and television shows in between doing what I’m sure they really wanted to be doing, namely, examining the fantastic data that was coming in from Huygens. I watched a live BBC special on the landing last night, and I’ve watched several interviews and press conferences online, and I’m in awe of the grace with which these scientists handled the public pressure on them - the desire for images, more images, color images, panorama images, sounds, new information… I’m especially proud of Marty Tomasko, head of the Huygens imaging team at the University of Arizona in Tucson, who worked so hard to get pictures out to the public as fast as possible yesterday, and who was friendly and enthusiastic even when you could sense that he kind of wanted to be getting back to his real work. It’s people like him who keep people like me dreaming about the wonders of space. This image has been used with the kind permission of the Jet Propulsion Laboratory.